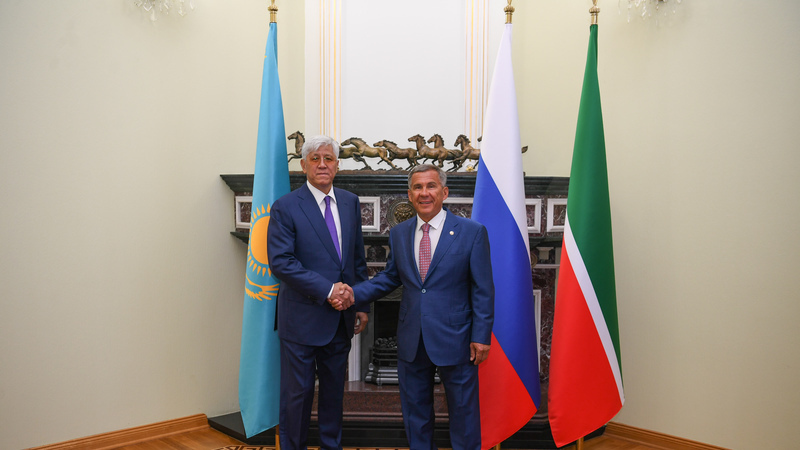 On August 8, in the afternoon, at the Governor's Palace of the Kazan Kremlin, Tatarstan President Rustam Minnikhanov had a meeting with Akim of Almaty region Amandyk Batalov. The delegation of Almaty region of Kazakhstan arrived on a study visit in Tatarstan on August 7-10, 2018. The members of the delegation visited Tatarstan Investment Development Agency, where they were presented the industrial and investment potential of the republic. Later on the same day, Kazakhstan colleagues visited the technopark in the sphere of high technologies "IT-park" and the centre of Eidos-Robotics and Eidos- Medicine. Welcoming the guests, Minnikhanov noted that the relations of Tatarstan as a region of Russia and the Republic of Kazakhstan are constantly strengthening. He visited the Almaty region in August 2017 and the Kazakh colleagues have arrived in Kazan in the current year. Minnikhanov said that such a Kazakh infrastructure facility as the International Centre for Cross-Border Cooperation (ICBC) "Khorgos" is of great interest and has a high potential. Tatarstan President noted the importance of the Kazakhstan project as a link between China, on the one hand, Tatarstan and Russia as a whole, on the other. The special economic zone “Khorgos - Eastern Gate” is located in the Panfilov district of Almaty region on the border with China. It includes an international cross-border cooperation centre, a dry port, an industrial zone, a settlement and a support infrastructure. “This is the largest transport, logistics and production hub of the world class. As part of the development of the transport corridor “Europe - Western China”, the role of this project will grow. We must pay attention to it and find opportunities for the presence of our business, use its potential as a link. The project has great prospects and will be important for Russia,” Tatarstan President emphasized. He noted that the trade turnover between Tatarstan and Kazakhstan amounted to 700 million US dollars in 2017. Minnikhanov said that Tatarstan is interested in expanding economic and investment relations with Kazakhstan partners. The cooperation in such areas as car manufacturing, shipbuilding, helicopter industry and petrochemical industry, high technologies, agriculture and health care is of great interest. During the meeting, Batalov said that Tatarstan has much to learn from and to adopt the experience in different areas. First of all, this is the development of such industries as information technology, digitalization and the development of working professions. At the end of their meeting, Minnikhanov and Batalov answered journalists' questions.